I was out that evening looking at some strangely lit clouds to the west, took some long exposure pics of them, then turned my attention to the new wind turbines they put in. They were back lit by the city light glow from the Southeast, so I took a couple of long exposure pics of them as well. In the middle of one of the exposures I’m scanning the sky at just before 9:30pm, and see a white solid light real close to the horizon to my east southeast. I figure its an airplane on approach to the local terminal but then it starts moving away from the airport, then vanishes. Ok it was a plane taking off, staying FAR to low to the ground, and turns off its lights, nope. It reappears same place it vanished but higher in the sky, sits there vanishes, reappears same spot, flys left, flys right. 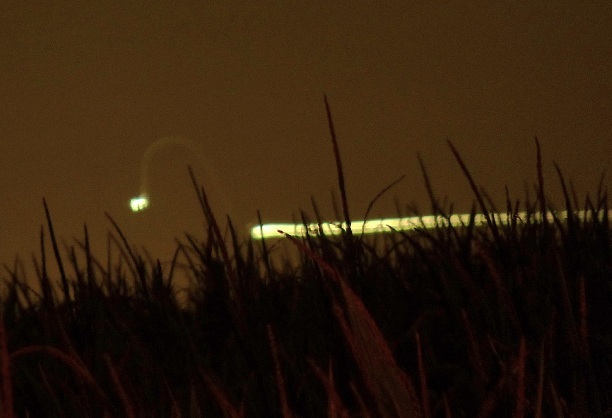 I’m canceling the long exposure pic of the turbines and trying to get this white light into focus but it is behind the corn stalks its so low, then it pops straight up, and sits there. I quickly get it as focused as I could and take a 60 second long exposure pic of it. It sits there for about 10 seconds. No noise, its between 5 and 8 miles away, not moving. I’m wondering if I got my lights mixed up as my eyes were on setting the camera. Then it vanishes to my eye and instantly it is lower to the corn field barely visible to me from where I was standing and began moving south again real slow and as it glided along the light slowly faded. I hoped it was still in the camera view port. The one minute exposure ended. I hoped and prayed the battery life of the camera would hold on long enough to finish the long exposure recording the low battery light had been flashing a few minutes beforehand. I hopped in the car and headed home. I looked at the pic once I got home on the camera LCD display. When it was higher in the sky and vanished to instantly appear closer to the ground and move off to the right. That vanishing point was actually it making an incredible maneuver! I caught it on film thank god. It made an upwards arc like a lowercase “n” and dropped further down to the field at full bright again and moved slowely off to the right. No flashing. I put the picture on the computer and could see the loop no problem and when I printed it, it came out too dark to see the loop, so I made a copy of the pic and altered the copy to be lighter to be able to see the arc, as it is seen on the camera display. I have not downloaded it off the disk. And the original is still intact and unaltered.